There's nothing more heart-warming at Christmastime than family gathered around the holiday table as stomachs fill with comfort food and souls brim with joy. It's a sweet escape from the heart-ache, the suffering, the loss, and turmoil that seem to never let up in this broken world of sin. From Thanksgiving to Christmas though, time seems to stand still, for just a little while, as young and old come together, not only to mix, bake, and serve the people who mean the world to them, but also to share their memories of Christmases past while making memories for future Christmases. Some of my fondest childhood memories at Christmas are watching my mom scurry around the kitchen and the perfect blend of aromas wafting through the house. There was always a turkey or ham baking in the oven, the homemade dressing being prepared to go in the oven, more than enough side dishes for an army, and of course, the delectable desserts. All of it made my mouth water as we anticipated the festive meal to come. My mom was a fabulous cook, and I'm sharing with you her Chocolate Pound Cake recipe at the end of this post, and will be sharing some of my family's favorites in the weeks to come. Comfort & Joy are not simply words spoken and sung during this most wonderful season of the year. 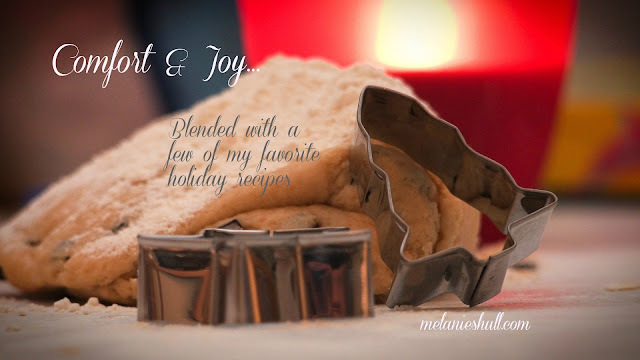 Comfort and Joy are gifts, real ingredients God kneads into the dough of our lives everyday throughout the year. Reading a verse this morning from a passage I've been trying to memorize this year made me realize just how much comfort and joy our Savior pours into our lives especially in times of suffering. You rejoice in this, even though now for a short time, if necessary, you suffer grief in various trials so that the proven character of your faith - more valuable than gold which, though perishable, is refined by fire - may result in praise, glory, and honor at the revelation of Jesus Christ. Every ingredient has been carefully selected by our Creator and written into the recipe of our stories here on earth. Whether it's a pinch of grief, a dash of disappointment, or a heaping tablespoon of fiery trials, each ingredient is measured to holy perfection so the aroma of Christ can permeate through us and into the lives of others. The baking inside the Refiner's fire for a set amount of time at a certain temperature is crucial to transforming the mixture into a flavor-full masterpiece - all part of the Master's plan to bring His comfort and His joy to His people around His glorious table. How is God gifting you with His Comfort & Joy today? If you make the recipe below, I'd love to hear how it turns out. ENJOY! Junelle Cook's Chocolate Pound Cake (written in my handwriting over 30 years ago). Today, instead of shortening, it would read: 2 sticks of butter (allow to soften a bit before mixing). Also, add 15 minutes to the baking time on the card (unless your oven cooks really fast). Test cake with a toothpick after 1 hour and 45 minutes. Insert the toothpick close to the center of the cake. If clean when pulled out, then the cake is done. If not, continue baking for another 10-15 minutes. Test again. Remove cake from the oven. Let it cool in the tube pan at least an hour before removing from pan.